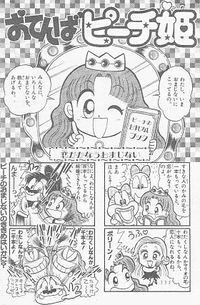 Otenba Peach-hime (Japanese: おてんばピーチ姫 Otenba Pīchi-hime), in English, roughly Tomboy Princess Peach was a manga gag strip by Sayuri Jo (now: UeShigeru ☆ Sayuri) which was published by Shogakukan (小学館) in its Shōgakusannensei (小学三年生, "Elementary School Third Grade") magazine from 1992 to 1994. As the name suggests, it starred a young version of Princess Peach. Other characters such as Mario, Luigi, Bowser, Pauline and Wendy O. Koopa also appeared. This page was last edited on November 5, 2017, at 19:54.